Day 38, 7/21, Dalbo, MN to Minnetonka, MN: 58.5 miles, 2,132 ft elevation gain, 12.8 mph average speed. Trip Totals: 2,175.8 miles (68 mile daily average), 94,486 ft elevation gain, 12.3 mph overall average speed. We woke up this morning to the smell of a big pot of oatmeal, prepared by chef Tom. Tom had dried fruit, nuts, and granola to top the oatmeal and it was delicious. We said goodbye to Steph and Tom (they’re heading south to Madison and skipping the UP, so we won’t see them again on this trip) and left the bicycle bunkhouse around 8:30a. The first 20 or so miles were fast, relatively flat, and pleasant. We got to St. Francis, a town big enough to have a McDonald’s, and as has become our tradition if we see a McDonald’s before 10:30a, we stopped in to get breakfast sandwiches and orange juice. 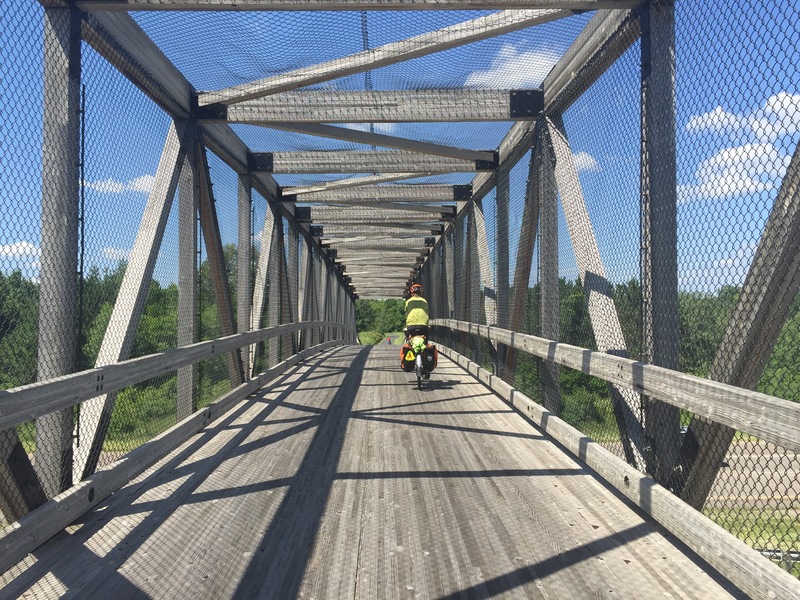 The next 38 miles of riding were decidedly unpleasant, mainly because we were approaching the biggest city we’ll see on our trip (excluding NYC, of course) – Minneapolis. Minneapolis has a lot of suburbs that expand out for miles in all directions and the majority of our trek from the northeast suburbs to the southwest suburbs was high-stress. We encountered many four- to six-lane highways with no shoulder and only sidewalks to ride on. We rode on a nice trail for a couple of miles, though, which was a refreshing change of pace. 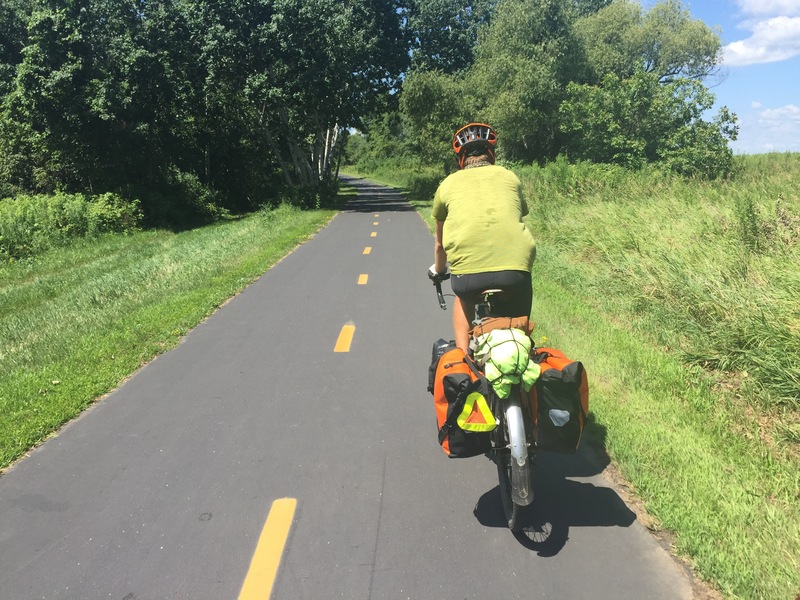 Minnesota is the most bike-friendly state we’ve ridden in so far. We learned that there are over 1,500 miles of trails in the state and they’re continuing to build more. However, it’s interesting how a generally bike-friendly culture reacts to people riding bikes in places that are not conducive to or designed for bike riding. Lots of anger directed our way. But there was no way around it unless we rode into the city and back out (like taking the two short sides of a triangle rather than the hypotenuse), so we suffered through. Our first stop was the REI in Maple Grove. We’ve been pretty excited for this trip to REI because my sleeping pad recently broke in an unfixable way and the lock we bought there is horrible and impractical. We returned these things, then I spent almost 30 minutes trying out different sleeping pads only to give the REI Flash a third try. It packs small and light, it’s comfortable, and all comparable sleeping pads sell for $50 to $100 more, an expense I can’t justify. Here’s hoping it doesn’t break a third time, at least not before the end of our trip! We were starving so we got some quick chicken sandwiches from Chick-Fil-A, then headed to Minnetonka to visit my family. 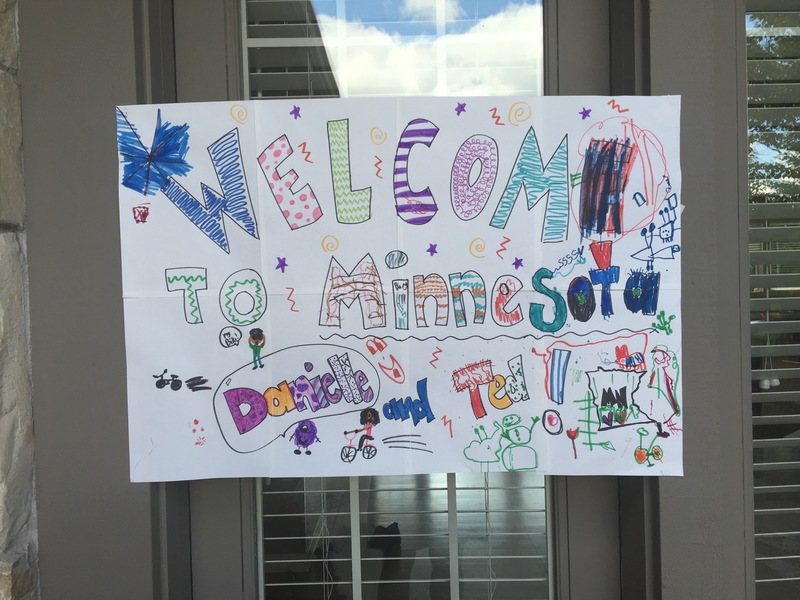 We were greeted by this beautiful sign at the door, created by my amazing, talented, beautiful, bright cousins, Sydney (9) and Jonah (6). Sydney and Jonah were home, so unfortunately for them, they had to deal with our sweaty, stinky hugs. Soon after we arrived, Sydney and Jonah were off to basketball camp, so we showered and relaxed for a bit before heading out with my uncle Pat to pick them up. We caught the end of Sydney’s practice, so we got to see her dominate the co-ed scrimmage. She made two out of the three or four baskets that were made during the scrimmage and displayed some impressive speed and defensive skills. She stole the ball a couple times, and Coach Jarvis stopped the scrimmage to make one of her steals a learning moment about how to dribble against a good defensive player. So proud! We headed back to their house, where my uncle Pat and aunt Michele prepared a delicious meal of buffalo blue cheese chicken burgers, salad, and fries that we ate in their beautiful screened-in porch. They also picked out a couple of bombers of delicious local microbrews. Before we ate, though, Ted and I got our butts kicked in a little 2v2 basketball game against Sydney and Jonah. Jonah makes almost every shot he takes and Sydney, as I explained, is a beast. But still. We probably shouldn’t have struggled to keep up with a six- and a nine-year-old. The next day we woke up to an enormous breakfast prepared by Pat, including eggs, hash browns, bacon, sausage, and english muffins with homemade jelly. Pat took the day off, so we headed to the Como Zoo in St. Paul. 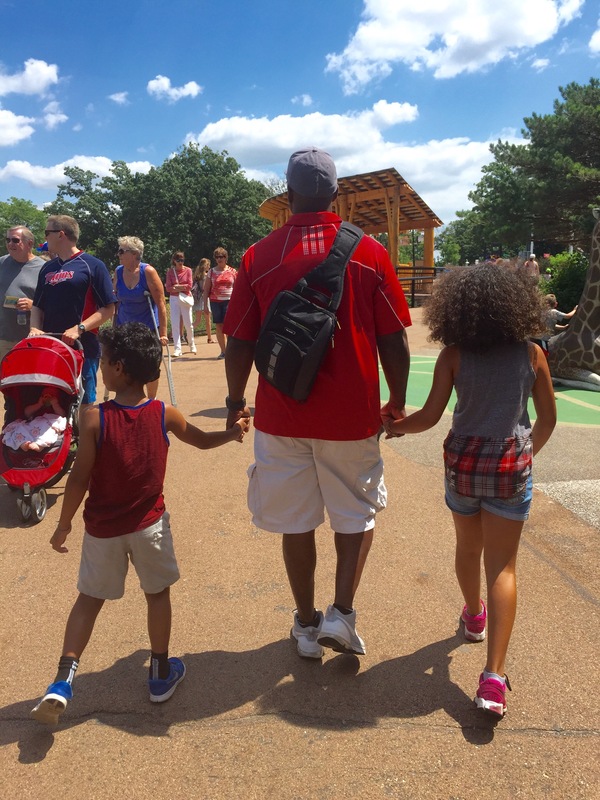 We checked out some of the animals first, then headed to the attached amusement park. 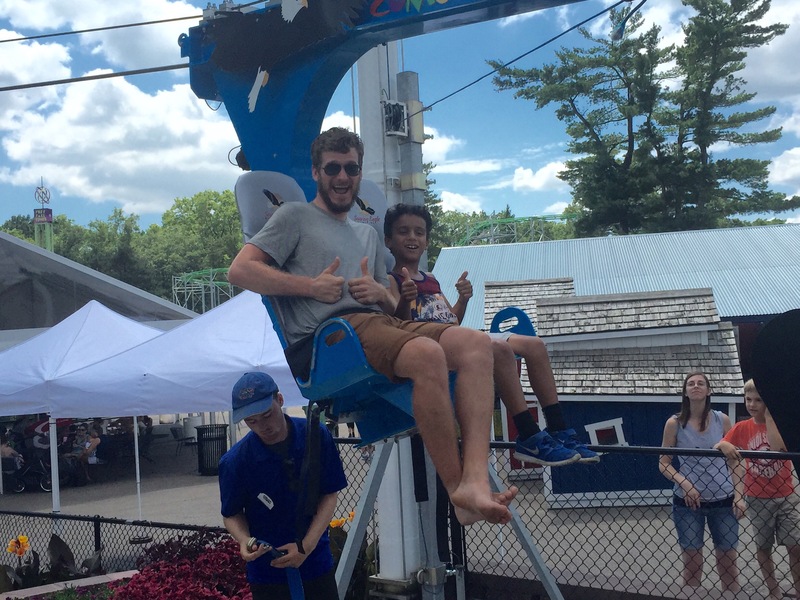 We rode lots of rides, including a zip-line, a roller coaster, and a pirate ship. It’s been years since I last rode on an amusement park ride and I forgot how well they do at turning your stomach. 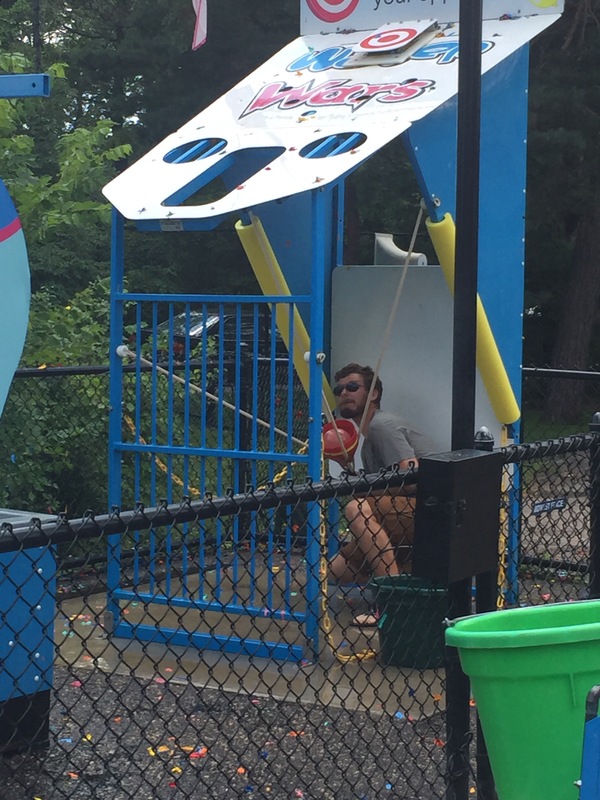 The hit of the day, though, was this water ballon slingshot game in which one person slings a water ballon through the air, aiming at a platform above their competitor to drench them. 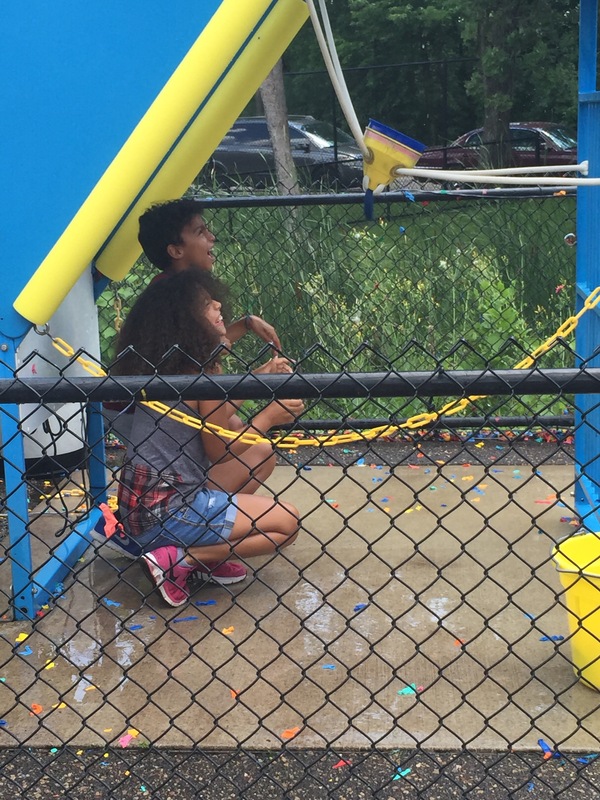 My cousins, yet again, showed us their superior hand-eye coordination by soaking Ted more than he soaked them. Sydney went to dance practice after we got home while Ted and I hung out with Jonah. Jonah is a focused, talented, and energetic dude. 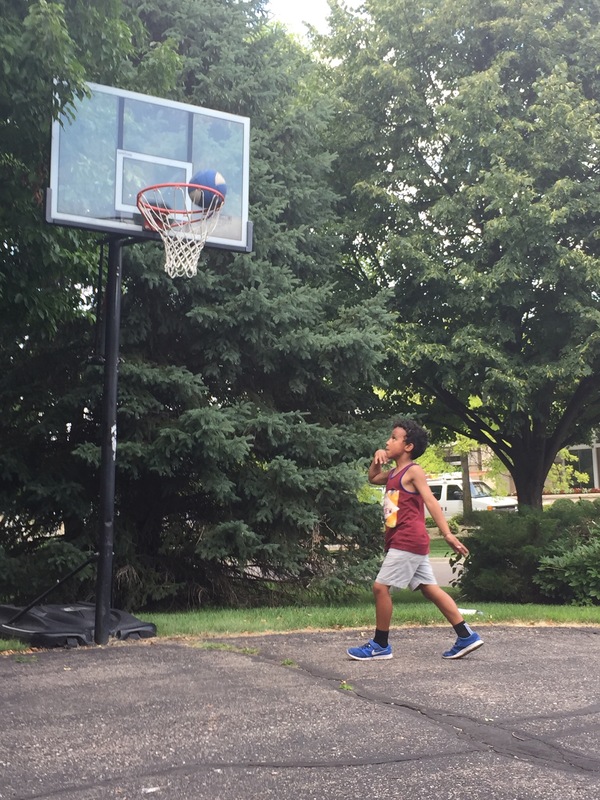 He ran around shooting baskets until he reached 101 (because he wanted to make more than 100 baskets), and he made almost all of the shots he took. Then, because he still wasn’t tired, he rode his bike for over an hour without stopping while talking to me about dogs. While Jonah dazzled me with his basketball skills, Ted spent a few hours cleaning and adjusting the bikes. My bike hasn’t been shifting properly, and he spent a good amount of time adjusting it and then getting frustrated by its absolute refusal to stay adjusted. He ended up riding it to a bike shop a mile away, where he learned that my rear shifting cable was sticking and needed to be replaced. The bike shop folks were super friendly and excited about our trip, and while they replaced the cable and housing (for free! ), they also let Ted test ride a fat bike, which he loved and now wants, even though I keep reminding him that we live in 319 square feet. When Sydney and Michele got home from dance practice, Sydney showed me her tap routine (which was impressive, of course), while Pat and Michele prepared yet another spectacular meal. We had salad, sweet potato chips, grilled chicken with two different marinades (northwoods and applewood smoked) and Kalbi marinated pork. It was all yummy, but the Kalbi pork in particular was wonderful! We are getting so spoiled! I don’t know what we’re going to do when we have to cook for ourselves in our little camp pot again. After dinner, Sydney directed a movie starring all of us. Ted played a “creepy janitor” who moonlights (daylights?) as the school librarian and who stole Michele’s hat, only to be caught by Pat, who excelled in the detective role. After shooting the movie, it was time for us to go to bed. We have to bike again tomorrow, after all. We couldn’t have asked for a better rest day. 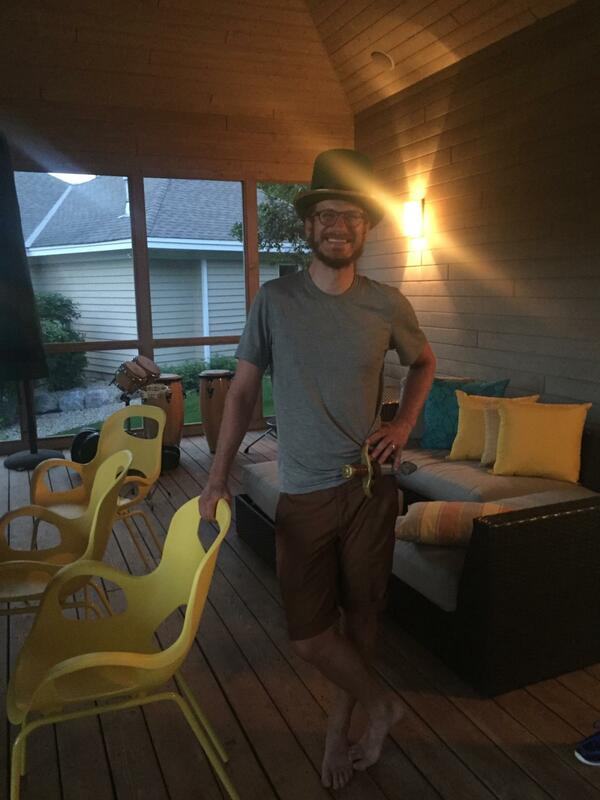 We enjoyed every moment we spent with the Minnetonka Cummings clan and are sad to have to leave so soon. Oh man, I really miss the Minnetonka Cummings clan. So glad you had the opportunity to get in a good quality visit with them. Thank you for calling yesterday Dani, it was great hearing your voice and about your wonderful adventure. Love yinz!! Those kids sound phenomenal! What a great time you must have had.